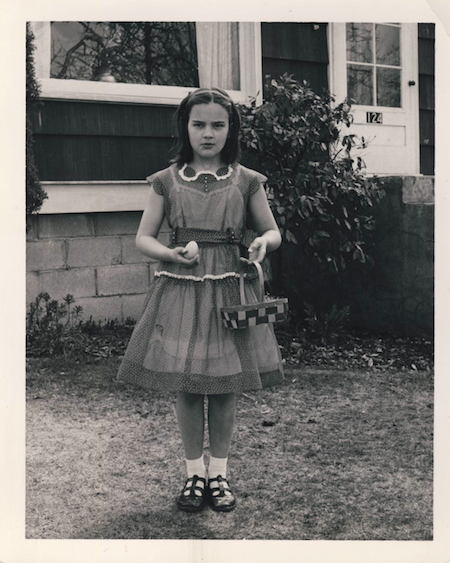 At Easter in my childhood, we searched for baskets of colorful hardboiled eggs. Easter was the only time of the year that my dad went to church with us, and my mom made sure we were looking spiffy. My dad always took our picture on Easter morning. 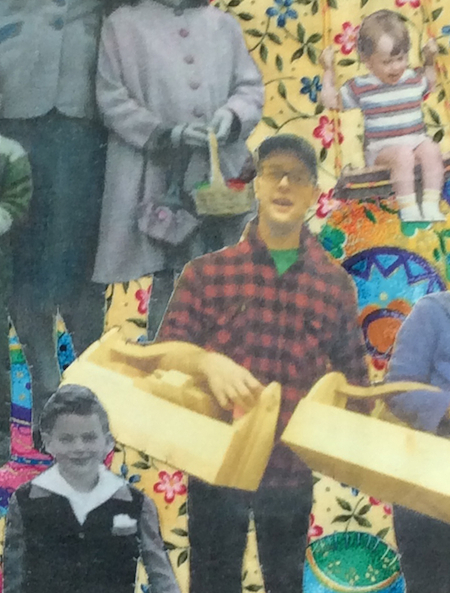 I printed images of my family onto Ultrasuede, then stitched them onto this tiny 8” x 10”quilt. It was fun to disregard time, and mingle the figures of myself and my brothers at different ages with their offspring. I appear three times—standing next to my mother, wearing my Easter hat and mary janes, and looking admiringly up at my nephew. The figures were arranged according to whim. For example, the kid on the swing is my nephew Karl. Diagonally below him is grown-up Karl, with his own father Paul as a child below him. The photos were printed onto Ultrasuede using TAP Transfer Artist Paper, then stitched by hand onto the background using a very fine thread. Photos from childhood are by my father, Loomis Miller; recent photos are by family members. This is a very timely and moving image, and I have looked at it quite a few times. What a good idea. I am sorting old photos now and memories and emotions are triggered with each new pile. My photo sorting started when I was also looking for Easter photos of our Dodge Cove groups. How did you get the image on the fabric? I used TAP Transfer Artist Paper by Lesley Riley. You can find this at quilt stores or online. The packet of papers comes with good instructions.Lesley’s book “Create with Transfer Artist Paper” is an excellent guide with lots of ideas and inspiration. With the TAP, you work with reversed or mirror-imaged digital photos that you print onto this special paper. Then you iron the TAP paper onto your fabric, then peel it off, leaving the image. Because both Ultrasuede and TAP are costly, I use Photoshop to arrange as many images as I can onto one 8X10” sheet. And I crop off most of the background first, as it doesn’t need to be printed and just uses up space and ink. Don’t forget to reverse your image before printing it.